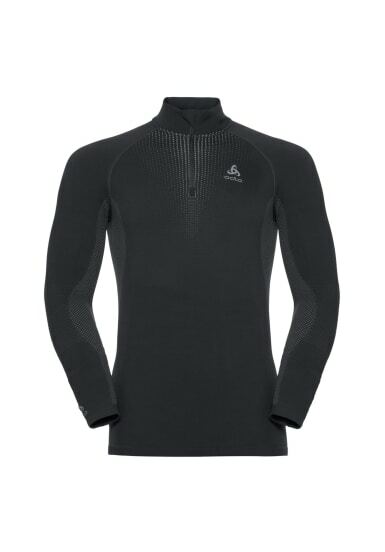 The Performance Warm SUW 1/2 zip long sleeve turtleneck top for men is your must-have performance layer this winter. Constructed with sophisticated seamless bodymapping, this baselayer provides perfect thermoregulation and freedom of movement on the mountain so you can attack your line with kinaesthetic precision and ultimate temperature comfort. With reliable wicking and drying properties, moisture is quickly moved away from the skin to help keep you dry throughout the day. Experience excellent thermal insulation when temperatures drop and enjoy a streamlined look and feel with an athletic male design that layers perfectly under bulkier outer layers. For a baselayer that works as hard as you do on the mountain, reach for the Performance Warm SUW 1/2 zip long sleeve turtleneck top from Odlo.